Something that was introduced to me back in April via Glossybox was a brand called Figs & Rouge. They make completely natural and 100% organic multi purpose balms. While predominantly you might use them for lips, it's also perfect for your face, hands and body. Both calming and soothing for lips and skin. People are becoming more increasingly aware of the use of more natural ingredients in cosmetics, which is great but it can be difficult to find things that aren't full of some kind of rubbish. For a lip balm, this contains just 5 ingredients. Yep, you read that right just five! Those are helianthus annuus seed oil, butyrospermum parkii fruit butter, cera alba, vanilla planifolia fruit extract, theobroma cacao seed butter. What made me fall in love with these balms when I first tried them was the texture. Before opening I was certain it'd be another Vaseline but the mixture is white and super soft. It melts easily on contact and provides a thin layer of hydration. 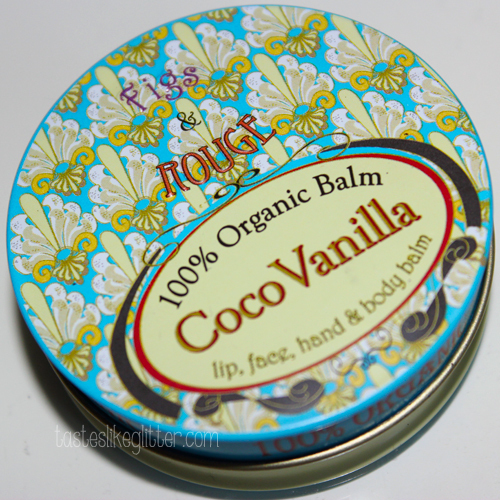 I picked up the Coco Vanilla in Boots (it's with the lip balms) for a reasonable £4.99. The scent is a natural vanilla, reminds me of vanilla cake, quite faint and not at all overpowering. I use this on my lips at night for a really intense treatment to stop them from drying out. It's a really nice product and definitely one to try out. It comes in 7 different scents, so something for everyone I'm sure. A little bit goes a long way and it leaves my skin feeling wonderful afterwards.